Once one of the five top-selling recording artists in the history of the music industry, John Denver will always be associated with the Rocky Mountains and the city from which he took his name. Born Henry John Deutschendorf, Jr. in 1943, Denver was an Air Force brat, and the guitar his grandmother had given him at age 8 accompanied him all over the southwest. “I had a lonely childhood,” he explained. “I would stand in the lunch line with my guitar. Somebody would ask if I could play it. I didn’t want them to be sorry they’d asked. You become a teenager and you go into a completely new place where you don’t know anybody—it’s hard to make friends. But you pull out your guitar and sing songs, and all of a sudden everybody knows you and says hello in the halls. He majored in architecture at Texas Tech, but he spent more time playing than drawing. Folk music drew him to Los Angeles midway through his junior year, where he renamed himself after his favorite city—“I liked it because my heart longed to live in the mountains,” he said. Denver received his first major break when he was selected as the new lead singer out of 250 candidates to replace Chad Mitchell in the popular Chad Mitchell Trio. He began writing songs during his three-year tenure and left for a solo career in 1969. Less than two years later, Denver was zooming up the pop charts with “Take Me Home, Country Roads,” the first of many hits. “It’s very much an autobiographical song,” Denver said. “It came out of several things. I finally moved to Aspen and made it my home in my 27th year. I’d been to Colorado—man, I wanted to live in the Rocky Mountains. “I did a lot of camping that summer, which had me getting back to the things I love most, the beauty of the land and the quiet of the wilderness. There was a meteor shower in August, a really glorious, spectacular night. I’m an amateur astronomer, and from that time on, there’s never been a better one. “And I was questioning what was going on in Colorado. I’d been around the world, a lot of places with growth. “There was all this stuff going on about having an Olympics in Colorado, and with my experience, I was very much opposed. I didn’t want a bunch of development going on—Colorado was precious to me. “So that’s what was going on in my mind—really feeling like I’d found home, a glorious night under the stars, and the problems facing any place as beautiful as Colorado where tourism is the primary industry. The grinning sprite in granny glasses (“Far out!”) insinuated himself into the world’s consciousness with “Sunshine on My Shoulders,” “Annie’s Song,” “Back Home Again” and “Thank God I’m a Country Boy.” The strength of Denver’s popularity was measured in record sales that few other artists have achieved, including eight platinum albums in the U.S. alone. 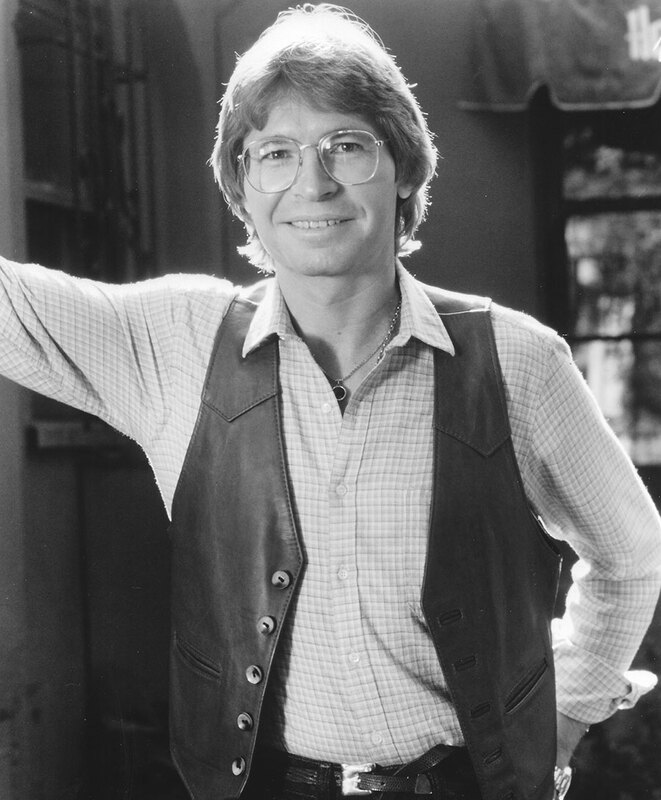 John Denver’s Greatest Hits was the largest-selling album in the history of RCA Records. Rock critics never had any use for Denver’s music or the cheerfully optimistic image—the “hokey nature-boy media shtick” of his ‘70s heyday made him a punch line. But for millions of fans, his skill at simple, melodic folk-pop made him the biggest of stars. “The worst things that have ever happened to me have been what people said about my music—‘the Mickey Mouse of pop,’ or ‘the Ronald Reagan of rock,’” Denver said. “That’s aimed at diminishing not only me, but all the folks whose lives have been touched by my music. I still meet people who use my songs in their weddings, who have played them while they’re going through labor. I met a young man with a terminal type of muscular dystrophy whose favorite song was ‘I Want to Live.’ I got to sing it for him. That transcends anything in the paper that’s going to be thrown away and burned—or, at best, recycled. Bill Danoff and Taffy Nivert, the clean-cut, all-American couple who co-wrote “Take Me Home, Country Roads,” created the Starland Vocal Band and became the first act signed to John’s new Windsong label in 1975; “Afternoon Delight” was a No. 1 single. Denver starred alongside celebrities as diverse as opera singer Beverly Sills, violinist Itzhak Perlman and flautist James Galway. Frank Sinatra was the “Friend” in Denver’s John Denver and Friend television special, and their “back-to-back” co-billing at Harrah’s Tahoe was one of the most sought-after tickets in the casino hotel’s history. Denver and Placido Domingo recorded “Perhaps Love,” a song written by Denver, as a duet, earning the Spanish tenor considerable recognition outside of the opera world. Denver used his popularity to promote his favorite cause: the environment. His appreciation and concern spurred him to found the Windstar Foundation in 1976, a non-profit education and demonstration center dedicated to study alternative solutions to food production energy and land education. Many of his songs incorporated environmental themes. He was known for his close friendship with Jacques Cousteau, the most famous undersea explorer of the 20th century, and he wrote “Calypso” in 1975 as a tribute to Cousteau and his research boat of the same name that sailed around the world for oceanic conservation. Denver also demonstrated his enthusiasm for the environment with Plant-It 2000, a plan he created to urge people all over the world to plant as many trees as possible by the year 2000. Nearly 100,000 trees were planted in its first year of operation. “There are some real concerns in the world that ought to concern us all, but nobody’s paying any attention to them. My philosophy has been as big a part in my success as my songs. Because of my music, I’ve had opportunities presented to support environmental groups, to help for the presidential commission on world and domestic hunger, to make people understand nuclear power and weapons. Denver took his music beyond American shores, traveling to mainland China (where he was the first Western artist to do a multi-city tour) and the Soviet Union (the first time an artist had been invited to give public performances since the cultural exchange agreement expired in 1980), as well as Europe, the Far East, Australia, New Zealand and Latin America. His charitable activities encompassed a trip to Africa to publicize the food crisis there and act as spokesman for UNICEF’s fundraising drive. When Denver guest-starred on The Muppet Show, it began a life-long friendship between him and Jim Henson that spawned two television specials with the Muppets ensemble; A Christmas Together and Rocky Mountain Holiday are considered classics. Denver’s movie debut in the comedy Oh God! alongside George Burns was a solid hit. He also starred and guest-starred in many television productions, including Higher Ground and Foxfire, and the seasonal special A Christmas Gift, filmed in the Rocky Mountains in 1986. He guest-hosted The Tonight Show on multiple occasions and hosted the Grammy Awards five times in the 1970s and ’80s. Starting in 1982, Denver was absent from the Top 40; his output then focused on a more mature interest in the range of human experience, providing a base for his support of a wide spectrum of political and social interests. With his 1988 album Higher Ground, Denver took a path toward independence with his career. It was the first release on his own Windstar label, following management changes and the end of his relationship with RCA Records after 25 albums. While he crossed international borders on tour, his records had received limited exposure. “That problem has been one of misperception,” he said. “I think I’ve appeared to a lot of people as too goody-two-shoes, too nice. That was probably exaggerated to a degree when I had long hair and wore granny glasses. Over the last few albums, I really tried a fresher, more contemporary presentation of my music. But those albums did no better than any of my recent ones. “There’s resistance to me at the radio level. I either made some real enemies or did some stupid things, but programmers just don’t want to play my music. There’s so much crap out there, the heavy metal. But I think I’m writing songs better than ever. ‘For You’ is my best love song. It’s turned out to be the most popular wedding song ever in Australia; they can’t keep sheet music in the stores. In his only 1990 Colorado appearance, Denver performed a benefit for the Rocky Mountain Adoption Exchange and Hope for the Children. Denver’s father, a U.S. Air Force test pilot nicknamed “Dutch,” taught him how to fly, and his love for flying became a passion to bring them closer together. Denver, a licensed pilot, died at age 53 when his experimental aircraft crashed into the Pacific Ocean in October 1997.